One of the best ways to get to know a city or country is on foot. Walking makes it easy to stop and admire a building, an event or a scene, and I always find that it’s a good way to experience a place at the human scale. Also, seeing the way a city or country has changed through the evolution of its buildings and landscape can provide insight into its history. Walking helps me feel like I’m a part of it, even if it’s only for a short time. 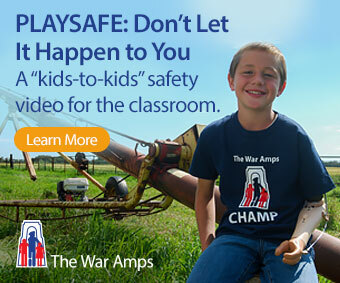 Best of all is the opportunity to see and meet people, and learn more about the place I’m visiting. Of all the walks I’ve taken on my many travels abroad, one of my favourites starts on the southeast coast of Australia at Bondi Beach, a suburb of Sydney, perhaps better known by its reputation as one of the best beaches in the world. The one-kilometre stretch of clean, white sand is a place of pride for Australians. It is well-used by locals, many running on the sand at dawn before going to work, and others soaking up the sun during the day or surfing the gorgeous waves that curl and break just off the beach. And it is packed on sunny weekends when people come from all around Sydney to enjoy the beach and the many activities happening there. This is also a place of pilgrimage for people from around the world, both for the surfing and the lifestyle, and I am always energized by just being there. I like to do my walk in the morning, before it gets too warm. 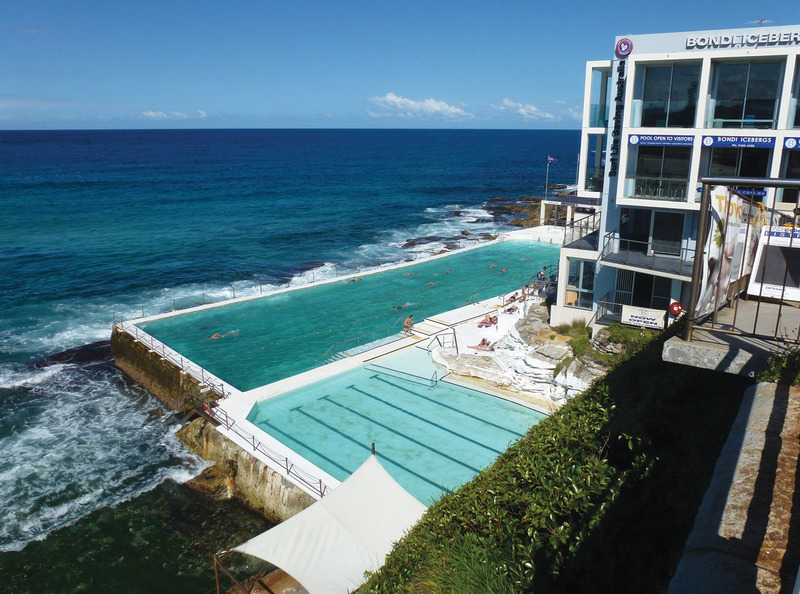 I start at the north end of the beach, by the rock pool and the North Bondi Returned and Services League (RSL) Club. You can take a look at the view from the RSL Club bistro on a web cam (http://www.northbondirsl.com.au/beach-cam) to see what the beginning of the walk looks like. One thing to know before starting out is that Aussies drive and walk on the left, so to avoid other pedestrians, be sure to keep to your side of the path. On this walk I stick to the hard surfaces of the promenade along the beach and the path that follows, but you can always do a lap on the beach if you prefer. (This is a new experience for many people, because the sand is so fine that it squeaks when your feet sink into it.) The promenade curves along the beach, past the famous surf lifesaving clubs that originated here, and at the midpoint, the Bondi Pavilion. First opened in 1929 to house men’s and women’s change rooms, Turkish baths, shops, and tea room, the Pavilion has been modernized over the years to remain a community centre and place for staging local events. 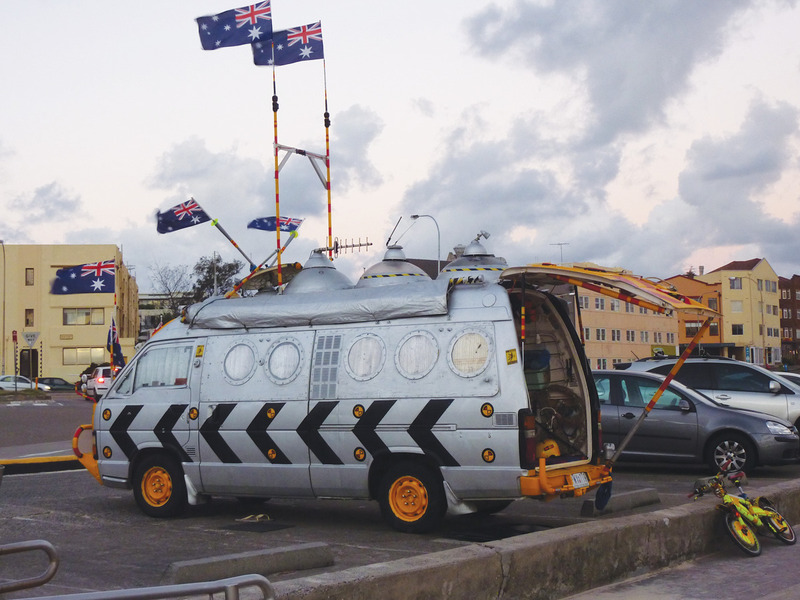 On my first day at Bondi Beach this past September, I was treated to the Festival of the Winds, an event featuring hundreds of kites flown from the beach and surrounding park, plus music and other entertainment. Further along, you will see murals painted along the wall backing the promenade. Some of the murals commemorate fallen Aussies, including the victims of the Bali nightclub bombing in 2002, and the valiant Australian and New Zealand troops at Gallipoli. Remarkably, these ones remain untouched by vandals. Once you leave the beach, you head up a hill or a set of stairs and past the Bondi Icebergs. This is a popular complex, located along the side of the cliff, containing an outdoor saltwater swimming pool, fitness club and social club. It’s a toss up whether the ‘Bergs or the RSL Club has the better view. You wouldn’t be able to gauge by the size of the membership fee, which is an astonishing $25 a year at each place. Aussies don’t go for pretension around here, but don’t let the “she’ll be right” attitude fool you about their dedication to fitness. There are some top athletes living and training in Bondi, including four Olympic medalists I’ve met. If you’re looking to get into shape while you’re in Sydney, sign up with someone like uber-fit Dominique Le Toullec at the Icebergs fitness club. From here the path follows the shore, winding under rocky overhangs pockmarked by centuries of erosion, bordering the tops of the cliffs, and perched on boardwalks high above the breakers crashing onto the rocks below. There is always a fantastic seacoast vista from the path, which almost makes you forget that you are walking along the fringe of a metropolitan area containing 4.6 million inhabitants. With that number of people, you’re never alone. No matter what the weather or time of day, I have always met other enthusiasts walking and running along with me. I love the variety of terrain on this route, with a mix of undulating paths, sidewalks and stairways, having to resort to only one short stretch of roadway to skirt an inaccessible part of the cliff-edge. There are benches at some of the lookouts to stop and rest or meditate, and well-kept fitness stations dotted along the route where you can do different exercises. There is good signage as well, along with water fountains, toilets and places at the beaches you pass where you can buy food and drinks. Nature-minded people will find flowers blooming in places along the edges of the path. With its stunning cliffs, headlands and coastal landscapes, I always imagine that I share some of the best views in the world with the people living in the residences that border some parts of the walkway, without having to pay the high price of living in this coastal paradise. In fact, the houses and apartments surrounding the perfect little beaches in the bays at Tamarama and Bronte are some of the most sought-after in this part of the city. 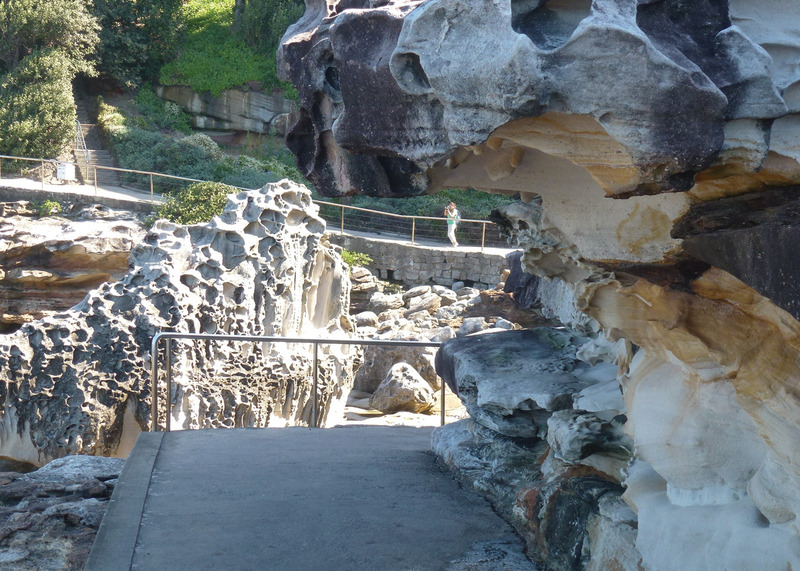 I sometimes walk past Tamarama only as far as Bronte, but on most days I will walk further and complete the four-and-a-half-kilometre route to Clovelly, and then back again. The guide for the North Bondi to Clovelly walk suggests allowing two hours for this one-way distance, but I do the return trip in less than one and a half hours at a good pace. It is worth taking a little extra time at the turning point, though, and seeing the cliff-top Clovelly Bowling Club. This has to be the best location for a lawn bowling club I have ever seen. 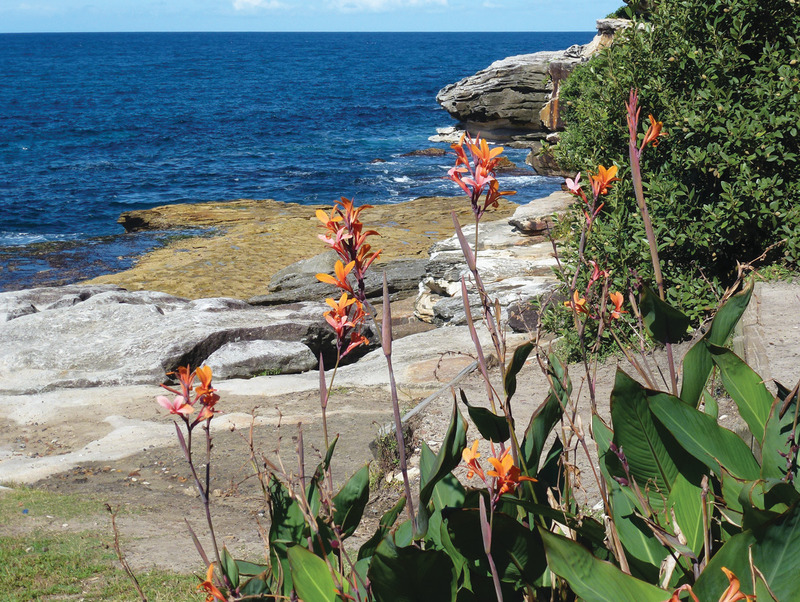 The grounds overlook the coast as well as Clovelly Beach and the beachside saltwater pool. 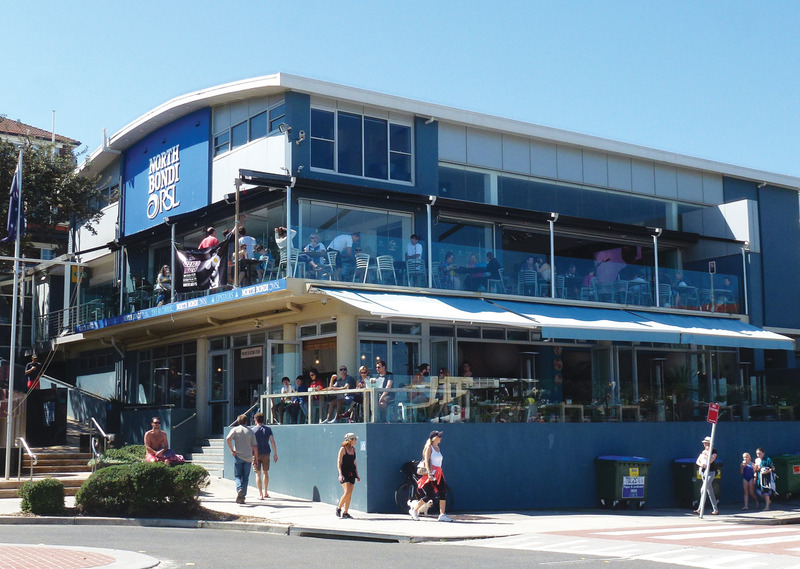 I was also introduced to a lesser-known use of the club: the Starfish Club at Clovelly Bowls hosts great jazz bands on the first Monday of each month. I can recommend it. 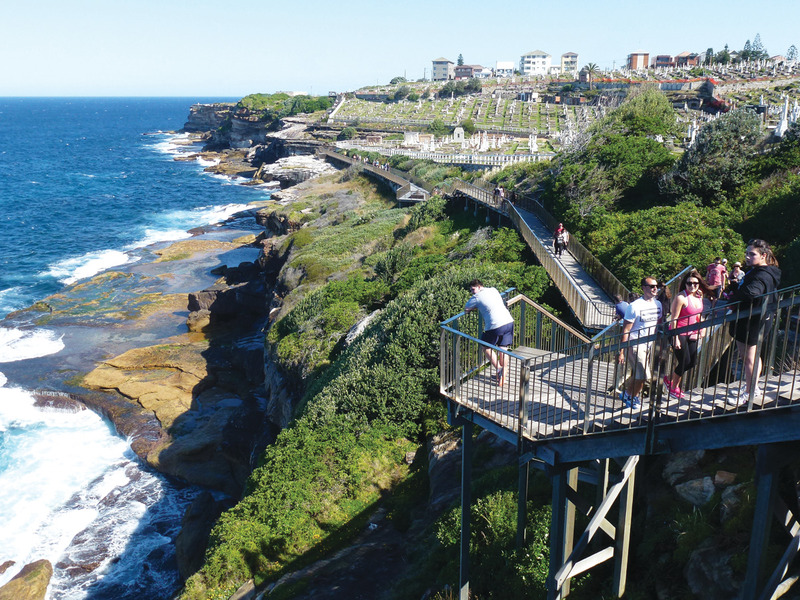 This route is just one leg of the more than one-hundred-kilometre system of coastal paths around Sydney called the Great Coastal Walk. Aussies are very much outdoor people so, lucky for us, it must have seemed natural for them to preserve a corridor for public footpaths that traces Sydney Harbour and the surrounding coastline. The walking network was developed by the Walking Volunteers in partnership with the Sydney Coastal Councils Group and the Department of Planning. You can follow the whole length in a seven-day urban walking expedition, or walk any part at your own speed. An itinerary is available from the Walking Volunteers, as well as maps and brochures containing information on public transit to reach each segment, and the location of toilets, picnic spots, shops and hotels. Of course, maps are available as a free App, called “Sydway Walker,” for the iPhone and iPad. These are all excellent resources for anyone planning to see Sydney on foot. For bus, train, and ferry timetables check Infoline Tel: 131-500. www.131500.com.au.